With the 2011 Cannes Film Festival set to roll out May 11, new projects are appearing tout suite. Among them, a big budget live action version of COBRA, helmed by Alexandre Aja, who directed the stylish HAUTE TENSION along with the more metroplex, mall-friendly THE HILLS HAVE EYES and PIRANHA remakes. Here’s the poster, courtesy of la version française de Premiere. but I knew that's what he was thinking. Anyway, in case you’re unfamiliar with manga artist Buichi Terasawa’s COBRA (and unless you're a card-carrying anime fan, there’s a good chance you are), think: A cigar-lovin’ James Bond/Han Solo in space meets TOTAL RECALL and THE BOURNE IDENTITY. An ordinary guy (or is he? ), takes a paid virtual fantasy vacation where he’s an ultra-alpha space pirate hero—only it later turns out to be true. He’s just forgotten he’s the dashing hero. He romances buxom blondes in space with his faithful partner Lady Armaroid by his side. Everything is very pulpy and very 70s, and I say that as a positive. There’s much more to it than that, but I don’t want to spoil any forthcoming space pirate adventure. The new film is currently slated for a summer 2013 release. 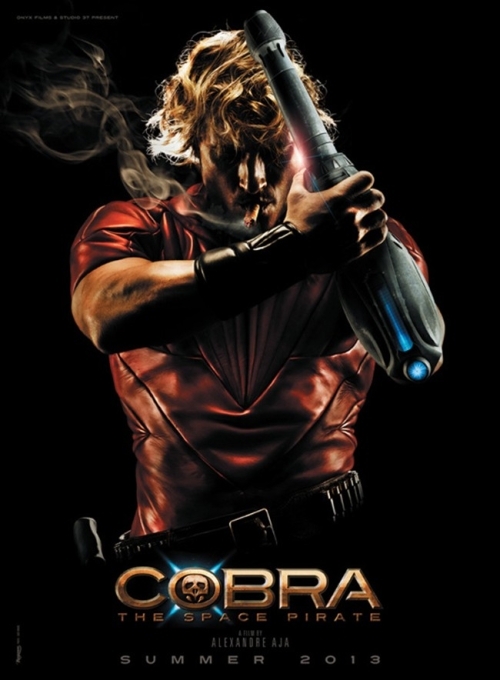 I'm curious to see if the filmmakers drop Cobra's lady's man rep for a straight-up love interest. I can dream, at any rate. Oh, and in case you’re wondering if any of this influenced my space pirate book, not really—at least not plot-wise. But I do love me some pulpy space pirate action! Alexandre Aja has a unique visual flair, along with a Paul Verhoven-esque love for on-screen blood, so I have high hopes for this one and wanted to run it up the jolly roger flagpole for ya.